'Tis the season for Kissable Lips with ChapStick. This year ChapStick is offering a variety of seasonally-inspired, limited-edition products to keep lips looking and feeling mistletoe ready throughout the holidays. This year's holiday offerings include new ChapStick mixstix Vanilla Candy Cane Milkshake, Pumpkin Pie, Candy Cane and a new holiday-themed tin containing ChapStick Candy Cane. 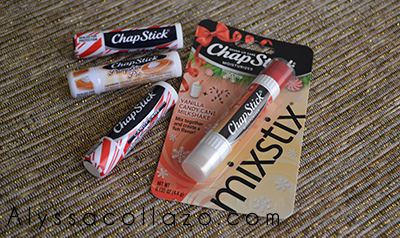 ChapStick mixstix delivers an innovative two-sided lip balm that offers one flavor on each side that can be worn alone or together to make a third unique combination. My favorite thing about ChapStick mixstix is that I can do combinations. I like doing Vanilla on my bottom lip and candy cane on my upper lip, rub together and BAM I have a Vanilla Candy Cane Milkshake! ChapStick mixstix Vanilla Candy Cane Milkshake is available for a limited time through the holiday season, beginning October 1st in a one-count package exclusively at CVS and Walgreens for an SRP of $1.99 ro $2.69. Two-count packages are available in the holiday section at Target for an SRP of $3.99. This year's seasonal varieties from ChapStick are flavorful stocking stuffers and fun gifts for friends, teachers, co-workers and family. I love Candy Cane ChapStick I buy it every year, it's also my 6 year olds favorite. This was my first time trying Pumpkin Pie and I love anything and everything pumpkin. It was like heaven on my lips. It smelt amazing and my fiance definitely enjoyed giving me extra kisses ;) ChapStick Pumpkin Pie and Candy Cane are available beginning October 1st the 1ct loose sticks will be sold for an SRP of $1.00 to $1.99 at Target, CVS, and Walmart. Tucked inside this festive keepsake tin are two tubes of ChapStick Candy Cane sure to bring Holiday Cheer. Keep your lips soft and smooth with ChapStick Candy Cane. I did not receive a sample of this ChapStick but I really love the idea of a ChapStick Holiday Tin and I know my daughter's would love this! The ChapStick Holiday Tin is available for a limited time beginning November 1st thorugh the holiday season exclusively at Walgreens for an SRP of $3.49. 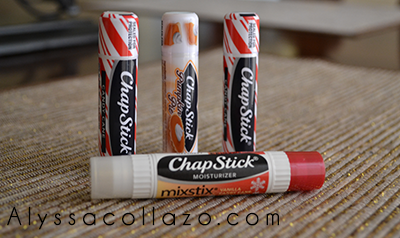 ChapStick makes the perfect stocking stuffer for any age! DISCLAIMER: All products received are complimentary for testing purposes from ChapStick. All opinions stated are my own and are not influenced by any affiliates. We have TONS of tubes of Chapstick laying around our house. Seriously, there are probably 40 of them. I can't wait to try these new flavors!! I am intrigued by pumpkin pie flavored Chapstick. Will definitely have to try them! WHAT!!? I need these in my life! I always give my best friend these for Christmas in her stocking. She goes through them like crazy! I always have chapstick in my purse. I have to try the milkshake or maybe I'll just tell the hubs about it. That's already giving him an idea for Christmas. i think my daughter collects these cause she has all types of flavors.. its very cute. Chapstick is a lifelong favorite. It always goes into our stockings. All Chapstick user gather here...present. This can't leave my purse when I'm going out. No to dry lips. Yes, I love gift guides! We actually need to quick up some chapstick! I need all of these now! I never seem to have chapstick when I need it so I need extras to leave at work, at home and in my purse. It's nice that they have unique flavors for Chapsticks. The pumpkin pie would be perfect for Halloween. I use the vanilla chapstick. Never heard of the pumpkin pie flavor, though. Love all of these flavors as well as giving the tins as gifts and stocking stuffers. They do make good stocking stuffers. Just about everyone can use a good lip balm. 21st century Chap Sticks in flavors. Wonderful. New on my favorite things list! I love getting new chapstick flavors! These look awesome! We are Chapstick addicts. Couldn't get through the harsh New England winters without it. Chap stick is actually a brand? Why the heck don't they exist here then? The Vanilla Candy Candy Milkshake sounds so good. I need to get one of these. You just reminded me that I bought a peppermint one this weekend...now, where did I put it?! I love chapstick! I use it all of the time. I love the fun Chapstick they come out with every holiday season. Can't wait to get my hands (or, lips) on the vanilla candy milkshake one! I love putting chap sticks in my families stockings. You can just never have too many! I haven't seen these in the store! I'll have to look out for them! Chapstick is actually a really great idea for a stocking or something. So useful, although also very easy to lose. I am addicted to chapstick! Literally! I need to try these brands!